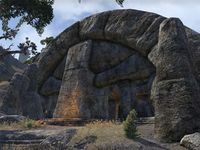 Exile's Barrow is a Nordic ruin located northwest of Orsinium. A small Orcish village can be found to the north, and has recently been troubled by draugr from the barrow. Exile's Barrow Objective: Find a way to return the draugr to their resting place.